Eton Mess is a classic British pudding, made with whipped cream, strawberries and crushed meringues – all mixed together and served in pretty glasses or bowls. It’s a great way to use up broken meringues, and is very quick and easy to make. You can vary the flavour of the cream and the fruits if you like, making it a very versatile dessert. We bought some strawberries on a recent visit to a local farm shop, and I bought some meringues too – with the view to make Eton Mess for our family barbecue the next day. But the meringues were way too pretty to crush up, so I reconstructed the mess instead! I simply whipped the cream with a little icing sugar to sweeten it, and a drop of vanilla extract for flavour. Then when it was at a nice, soft peak stage, I sandwiched the cream between two meringues and popped some sliced strawberries on top. Lush! Whip the cream with some icing sugar and vanilla extract. You can do this by taste - start with a tablespoon of the sugar and maybe ½ teaspoon of the vanilla. Do not over whip the cream - stop when it reaches soft peak stage. Check for flavour again, and fold in more sugar and/or vanilla if you want. Sandwich the whipped cream between two meringues and top with strawberries. I love Eton Mess so much…this has got me wanting a massive bowl of it! Delicious and a great way to have it. What a lovely idea and a nice twist you have given to this dessert. NOMZ! 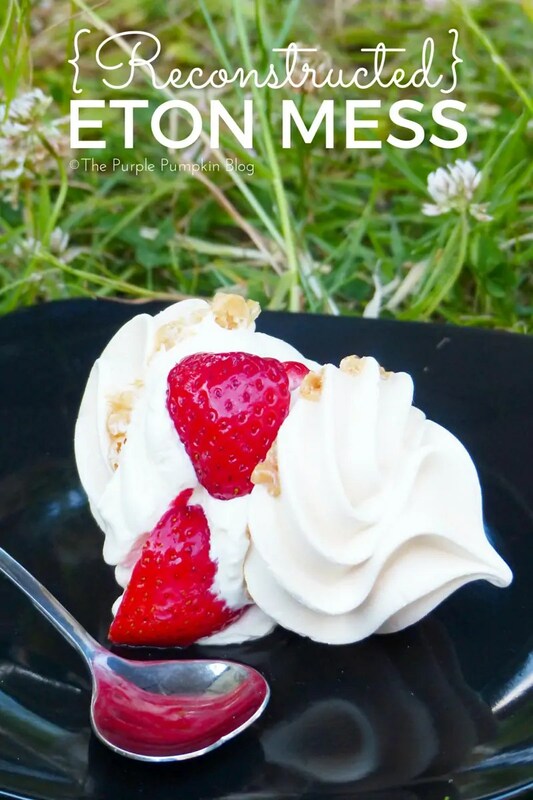 I’m a huge eton mess fan as it’s got all my fave things in it. Love the idea of sandwiching it together like this! We regularly make it, but we usually use creme fraiche (partly because there is always some in the fridge). Definitely one to try, it has been years since ive had Eton mess, but the Meringue has to be really crunchy!